09-Jul-2010 -- Underway from Vila do Conde (Pará, Brazil) to Dunkerque (France) today we made a short stop at Falmouth, on order to take over the necessary quantity of “Low Sulphur Fuel”, which is compulsory for steaming in northern European waters east of 5° W. The English Channel, the North Sea, and the Baltic Sea are so called “SECA”-Zones, where no fuel must be burnt by ships which contains more than 1.5% sulphur. As we are usually always trading in the Americas, where this Rule does not apply and such fuel is not available, we have to take it prior entering the SECA designated zone. Here in Falmouth is the latest possibility. Approaching Falmouth we could comfortably visit 50N 5W. Unfortunately, the weather was not so beautiful as England is usually known for. 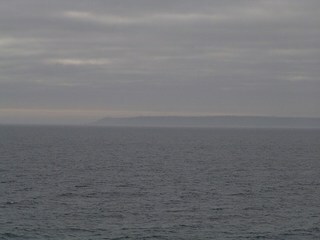 However, looking to WSW we can still see Lizard Point, which we rounded before, looking to West we see Black Head, and towards NW we see into Falmouth Bay. A sailing boat was around, and here it is exactly on the Confluence. Martin Battaliou plans to visit this confluence between the 24-Nov-2025 and the 24-Nov-2027. Comments: "Hopefully I can reach this spot on 21 June 2003"